90. Cartwright, K. C.; Tunge, J. A. "Decarboxylative Elimination of N-Acyl Amino Acids via Photoredox/Cobalt Dual Catalysis" ACS Catal. 2018, 8, 11801-11806. 89. Allegre, K. A.; Brennan, N.; Tunge, J. A. "Synthesis of Vinyl Cyclopropanes via Anion Relay Cyclization" Org. Lett. 2018, 20, 4191-4194. 88. Maity,P. K.; Tunge, J. A. "Assisted Tandem Catalytic Conversion of Acrylates into Adipic Esters" ChemCatChem 2018, 10, 3419-3423. 87. Torregrosa, R. R. P.; Mendis, S. N.; Davies A.; Tunge, J. A. "Palladium-Catalyzed Decarboxylative Benzylation of Acetylides and Enolates" Synthesis 2018, 50, 3205-3216. Published as part of the Special Topic Modern Coupling Approaches and their Strategic Applications in Synthesis, Erick M. Carreira Ed. 86. Li, T-R.; Maliszewski, M. L.;Xiao, W-J. ; Tunge, J. A. "Stereospecific Decarboxylative Benzylation of Enolates: Development and Mechanistic Insights" Org. Lett. 2018, 20, 1730-1734. 85. Smith, M. K.; Tunge, J. A. "Palladium-Catalyzed Synthesis of Conjugated Allenynes via Decarboxylative Coupling" Org. Lett. 2017, 19, 5497-5500. 84. Ramakumar, K.; Maji, T.; Partridge, J. J.; Tunge, J. A. "Synthesis of Spiroxindoles via the tert-Amino Effect" Org. Lett. 2017, 19, 4014-4017. 83. Locascio, T. M.; Tunge, J. A. 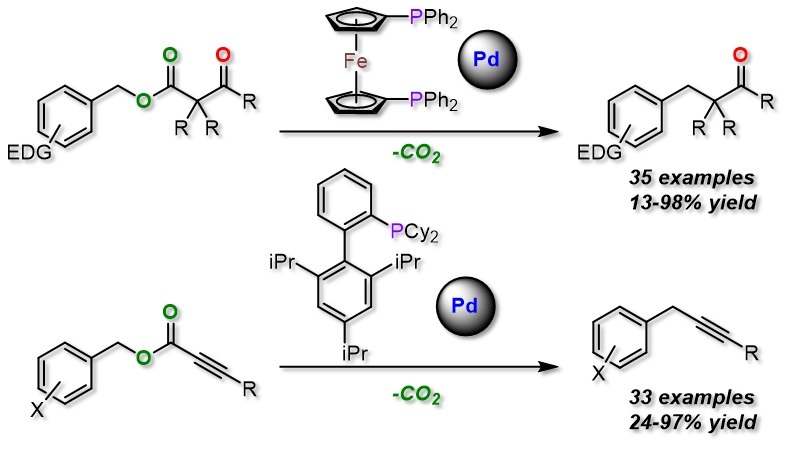 "Palladium-catalyzed Regiodivergent Substitution of Propargylic Carbonates" Chem. Eur. J. 2016, 22, 18140-18146. 82. Maji, T.; Mendis, C. H.; Thompson, W. H.; Tunge, J. A. "Evidence for Isomerizing Hydroformylation of Butadiene. A Combined Experimental and Computational Study" J. Mol. Catal. A 2016, 424, 145-152. 81. Maji, T.; Maliszewski, M. L.; Smith, M. K.; Tunge, J. A. "Catalytic Addition of Fluorinated Benzoic Acids to Butadiene" ChemCatChem 2016, 3343-3346. Highlighted by ChemistryViews. 80. Lang, S. B.; Cartwright, K. C.; Welter, R. S.; Locascio, T. M.; Tunge, J. A. "Photocatalytic Aminodecarboxylation of Carboxylic Acids" Eur. J. Org. Chem. 2016, 2016, 3331-3334. 79. Mendis, S. N.; Tunge, J. A. "Decarboxylative dearomatization and mono-alpha-arylation of ketones" Chem. Commun. 2016, 7695-7698. 78. Lang, S. B.; O'Nele, K. M.; Douglas, J. T.; Tunge, J. A. "Dual Catalytic Decarboxylative Allylation of alpha-Amino Acids and Their Divergent Mechanisms" Chem. Eur. J. 2015, 21, 18589-18593. 77. Mendis, S.; Tunge, J. A. "Palladium-catalyzed Stereospecific Decarboxylative Benzylation of Alkynes" Org. Lett. 2015, 17, 5164-5167. 76. Maji, T.; Tunge, J. A. "Palladium-catalyzed Double-decarboxylative Addition to Pyrones: Synthesis of Conjugated Dienoic Esters" Org. Lett. 2015, 17, 4766-4769. 75. Wu, X.; Lan, L.; Wilson, D. M.; Marquez, R. T.; Tsao, W.-c.; Gao, R.; Roy, A.; Turner, B. A.; McDonald, R. Tunge, J. A.; Rogers, S. A.; Dixon, D. A.; Aube, J.; Xu, L. "Identification and validation of novel small molecule disruptors of HuR-mRNA Interaction" ACS Chem. Biol. 2015, 10, 1476-1484. 74. Lang, S. B.; O'Nele, K. M.; Tunge, J. A. "Decarboxylative allylation of amino alkanoic acids and esters via dual catalysis" J. Am. Chem. Soc. 2014, 136, 13606-9. 73. Maji, T.; Ramakumar, K.; Tunge, J. A. "Retro-Claisen benzylation: direct use of benzyl alcohols in Pd-catalyzed couplings with nitriles" Chem. Commun. 2014, 14045-8. 72. Ariyarathna, Y.; Tunge, J. A. "Multicomponent decarboxylative allylations" Chem. Commun. 2014, 14049-14052. 71. Maji, T.; Tunge, J. A. "Catalytic alpha-monoallylation of aryl acetonitriles" Org. Lett. 2014, 16, 5072-5075. 70. Ariyarathna, Y.; Tunge, J. A. "Decarboxylative allylations of ester enolate equivalents" Org. Biomol. Chem. 2014, 8386-8389. 69. Ramakumar, K.; Tunge, J. A. "Synthesis of N-aryl-1-aminoindoles via intermolecular redox amination" Chem. Commun. 2014, 50, 13056-13058. 68. Lang, S. B.; Locascio, T. M.; Tunge, J. A. "Activation of alcohols with carbon dioxide: Intermolecular allylation of weakly acidic pronucleophiles" Org. Lett. 2014, 16, 4308-4311. 67. Xie, Z.; Fang, J.; Subramaniam, B.; Maiti, S. K.; Snavely, W.; Tunge, J. A. "Enhanced hydroformylation by carbon dioxide-expanded media with soluble Rh complexes in nanofiltration membrane reactors" AIChE J. 2013, 59, 4287-4296. 66. Grenning, A. J.; Van Allen, C. K.; Maji, T.; Lang, S. B.; Tunge, J. A. "Development of asymmetric deacylative allylation" J. Org. Chem. 2013, 78, 7281-7287. 65. Chattopadhyay, K.; Fenster, E.; Grenning, A. J.; Tunge, J. A. "Palladium-catalyzed substitution of (coumarinyl)methyl acetates with C-, N-, and S-nucleophiles" Beilstein J. Org. Chem. 2012, 8, 1200-1207. 64. Chattopadhyay, K.; Recio, A., III; Tunge, J. A. "Palladium-catalyzed, pyrrolidine mediated arylmethylation of ketones and aldehydes with coumarinyl(methyl) acetates" Org. Biomol. Chem. 2012, 10, 6826-6829. 63. Dunn, E.; Tunge, J. "Decarboxylative Allylation of Ketone Enolates with Rh, Ir, and Mo" Latvian J. Chem. 2012, 31. 62. Schmitt, M.; Grenning, A. J.; Tunge, J. A. "Intercepted decarboxylative allylations of nitroalkanes" Tetrahedron Lett. 2012, 53, 4494-4497. 61. Recio, A. III; Heinzman, J. D.; Tunge, J. A. "Decarboxylative benzylation and arylation of nitriles" Chem. Commun. 2012, 142-144. 60. Jana, R.; Tunge, J. A. "A homogeneous, recyclable polymer support for Rh(I)-catalyzed C-C bond formation" J. Org. Chem. 2011, 76, 8376-8385. 59. Grenning, A. J.; Tunge, J. A. "Deacylative allylation: allylic alkylation via retro-Claisen activation" J. Am. Chem. Soc. 2011, 133, 14785-14794. 58. Jana, R.; Tunge, J. A. “Migratory decarboxylative coupling of coumarins: synthetic and mechanistic aspects“ Angew. Chem. Int. Ed. 2011, 50, 5157-5161. 57. Grenning, A. J.; Tunge, J. A. “Deacylative allylation of nitroalkanes: Unsymmetric bisallylation by a three-component coupling” Angew. Chem. Int. Ed. 2011, 50, 1688-1691. 56. Weaver, J. D.; Recio III, A.; Grenning, A. J.; Tunge, J. A. “Transition Metal-catalyzed Decarboxylative Allylation and Benzylation Reactions” Chem. Rev. 2011, 111, 1846-1913. 55. Fang, J.; Jana, R.; Tunge, J. A.; Subramaniam, B. “Continuous hoomogeneous hydroformylation with bulky rhodium catalyst complexes retained by nano-filtration membranes“ Appl. Catal. A 2011, 393, 294-301. 54. Weaver, J. D.; Ka, B. J.; Morris, D. K.; Thompson, W.; Tunge, J. A. “Stereospecific Decarboxylative Allylation of Sulfones” J. Am. Chem. Soc. 2010, 132, 12179-12181.